2 by 2 Gaming invites players to step into a world of wonder and imagination in Dreams of Fortune: a 5x3 reel grid with 40 pay lines. The two bonuses contained within the slot offer a 5x4 grid in addition to 243 ways to win screen. Converse with the grinning dreams shepherd. He appears to be taking a nap when the player first starts spinning but will awaken should the alarm clock in the top left hand corner of the screen fall on his head. In this instance the player will be granted random wilds and also be asked to take part in dream bonus rounds. This is certainly not a particular striking game when it comes to the visuals. The icons do a slightly better job with fluffy clouds with the ‘z’ of sleepiness over them in addition to sheep jumping through a window, comfy bed and a bag of gold coins. This may send certain players to sleep but those that manage to stay awake could be in for a treat in the bonus round with a top prize of up to 121,500 coins. Chicago based development team 2 by 2 Gaming aim to create a variety of games which contain a wide range of volatility levels so players of all experience levels and betting preference can find a game for them. Their games mostly center on generic geographical and historical themes such as Riches of the Sea, a very well known slot by 2 by 2. While this developer doesn’t have a particularly good spread of 3-reel slot machines it does produced a number of slots featuring epic mystical adventures such as Spell of Odin and The Voyages of Sinbad. With 2 By 2 the player can rest assured that they will find a middle ground slot machine with decent bonus elements like free spins and bonus options. 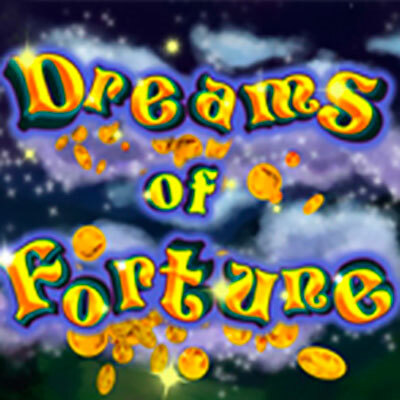 In Dreams of Fortune, the minimum bet is 0.30 credits with a maximum of 30.00. This may be slightly too small for the more experienced players but fits into the overall novice-friendly theme. There are two feature rounds that get randomly selected when you land 3,4 or 5 scatters. ‘Toss ‘n’ Turn’ gives the player 15, 11 or 7 spins for the scatters and the screen is then enlarged to a 5x4 with 40 pay lines. Every time the player initiates a spin, the shepherd appears and turns the reel he lands on to wilds. Should a sheep appear, this will re-trigger and award the player 5 extra spins. The Wild Dream bonus changes spins to 25, 15 and 10 for the 3, 4 and 5 scatters. The reel grid will change again to accommodate 243 ways to win format. The re-trigger and the dream shepherd wild stays the same but players should take note that the hit ratio appears to increase in addition to the top potential prize available comprising a whopping 121,500 coins. Lucky for players none of this is a dream! 2 by 2 presents a very simple, low volatility slot in Dreams of Fortune with a basic theme to boots. There is fortune for those dreamers who care to dig a bit deeper in the bonus rounds, but this will take more than a few brief sessions to crack unfortunately.